Fashion month drew to a close earlier this week. And while there were many incredible looks, vibrant colourways, print clashes and reworked silhouettes, some trends will always prevail based on their sheer awesomeness (aka wow factor). As expected from any spring/summer showcase, many designers built on the creamy pastel hues and whimsical florals of daydreams past, while others brought practical items to the main stage such as parkas, raincoats, trenches and tailoring with intriguing levels of detail or sartorial simplicity. And as charming and relevant as they are, these pieces with little persuasion will make their way down from high-end to high street integrating into wardrobes of the masses with ease. Which is why we’ve focused on the more out-the-gate ideas evolving from the fashion weeks of New York, London, Milan and Paris that have our early-adopter radar ticking into overdrive. Left to Right: R13, Tom Ford, Calvin Klein, Calvin Klein. Dig out the trucker cap because icons of middle America have gone high-octane this season. Denim jackets have been upscaled to new proportions with burgeoning shoulders and voluminous sleeves. Contemporary use of materials and cut see this nuanced nostalgia take on a fresh futurism. Designers have combined satin, checks and leather to add an element of individuality and a nod to the past-meets-present narrative. The toughness and attitude-ridden antidote of Americana will give your springtime softness the edge it needs. Left to Right: Erdem, Coach, Osca de la Renta, Michael Kors, Tom Ford. The sexiness, exuberance and ladylike elegance of ‘80s and ‘90s high-glamour is continued from the A/W 17/18 collections with feminine, skin-baring silhouettes drenched in sequins, satins and silks. The need for high-glamour dressing translates to a plethora of slinky yet powerful eveningwear. The slip dress remains a staple although updated in all-over sequins or subtle transparent detailing. Asymmetry is present across the necklines and hemlines of form-fitting dresses, perfect for the most glamorous of cocktail parties. Bring on the festive season, we say. Our athleisure obsession reaches new heights with its most recent injection of life seen in New York. The merging of sportswear and street fashion cashes in on the awkwardly-named ‘gorpcore’; drawing on the diverse subcultures straight from the city and combining the least cool items in your wardrobe. The colour clashes and fabric mismatches combined with plenty of attitude see common codes of dress being dashed in favour of making completely unstylish choices. Though inherently functional, worn together it forms a completely intentional style. You need to see it to understand it; and wear it, to believe it. Left to Right: Christopher Kane, Fashion East, Ports 1961, Burberry, House of Holland. 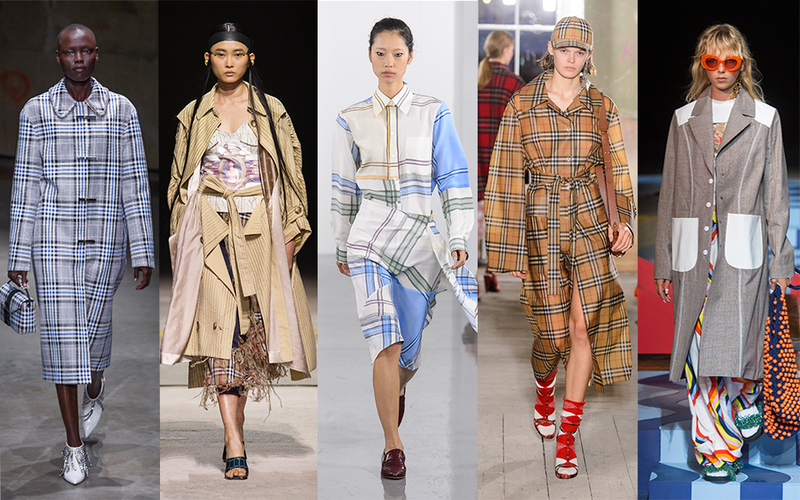 Britain’s heritage check was celebrated, reflected, and deconstructed in perennial items such as the car coat, the trench and the cardigan during London Fashion Week. And with the way our spring weather is heading at the mo’ with intermittent heavy downpours and chilly winds, there’s something super comforting and relevant in this trend that we will most certainly being adopting sooner rather than later. Seriously though, just look Burberry’s tartan stiletto x sock combo: If that’s not the epitome of style and comfort, then what is life? The notion of looking to the past to create the future has perhaps never been so relevant than in this emerging theme seen over fashion month. Regal opulence is back and boasts chiffons, silks and baroque-esque fabrics, cinched, oversized and with released sleeves and voluminous balloon hemlines. It’s time to batten down the hatches; the balloon skirt is back and literally bigger than ever. The lavish, commemorative mood in Milan prompts a flurry of new uber-bright and magnified blooms. Worn as a complete look, these statement-making florals come as part of a retro revival previously noted in vintage wallpaper, postcards and painterly prints. This ‘more is more’ trend was one of the many gestures of colour, print and texture seen at Milan Fashion Week, making it increasingly clear that designers were celebrating not just fashion this season, but something much deeper: our emotional connection to clothes. Left to Right: Roberto Cavalli, Versace, Dolce & Gabanna, Krizia, Prada. Animal motifs and jungle-inspired patterns gained traction in Milan as little critters added talkability to pieces. Appliqué placement of insects, fish or domestic animals add an off-kilter effect that works well for any age, while all-over leopard, zebra and tiger markings have continuing appeal. Giving us totally wild, wild, wild thoughts about how we’re going to upgrade our wardrobe, this fun and fearless trend works best dressed up to the max.